Bob Lum, a world-renowned knife maker from Oregon who passed away in 2007 at the age of 64, is considered the pioneer of the Americanised tanto style blades, but not only that, many were in fact his creations and collaborations with several prestigious manufacturers, such as Spyderco and Benchmade. 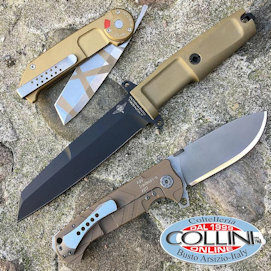 From Lum's ingenuity was born the Onslaught 741 design, which was produced by Benchmade and, in 2010, won the "Knife of the Year" award at the Shooting Industry Masters in Nebraska. In its first version, which was essentially similar to Lum's Forester design, the tactical/defense knife had a generous size with a blade of about 110 mm and a total length of about 245 mm when open. In the 746 mini version the knife definitely becomes more practical - although not as small as the "mini" word would suggest - and usable as EDC; the clip-point modified curved blade, 87.6 mm long and 2.9 mm thick, with a pronounced swedge, is made of 154 CM stainless steel - a versatile material that offers good performance in terms of corrosion and abrasion resistance, and a good performance of the cutting edge whilst maintaining a discreet ease of sharpening. The blade rotates easily on traditional bronze washers and is equipped with an ambidextrous thumb hole to enable its rapid and easy opening. The pivot consists of a male screw with a conic head and female Torx screw, probably with nickel-plating surface treatment given the particular color that would exclude the burnishing. The blade is marked on one side with the Company logo and the model number 746, and on the other with Bob Lum's logo. The locking mechanism, patented by the same American Company which purchased the rights from Bill McHenry and Jason Williams who invented this kind of mechanism, is the AXIS Lock. It consists of a spring-loaded pin that slides in a passing slot through the liners and the handle scales, which engages the blade tang that, in the open position, is firmly locked between the stop pin and the AXIS Lock pin. The advantages of this mechanism are manifold: in addition to an extreme robustness of the block (declared able to withstand loads of more than 200 lbs), it is also very safe because the knife can be closed with one hand without placing fingers on the passage of the blade (as is the case with most of the other blocking systems); also this system is totally ambidextrous (unlike the liner or frame lock, for example). The handle, constituted by G10 scales placed on 420J steel liners of 1.5 mm in thickness and separated by a round-shape spacer made of synthetic material, has a curvature - especially in the terminal part - which makes the ergonomics of the product very pleasant, conferring a comfortable and safe grip on the knife. The handle is equipped, in the terminal part, with a lanyard hole - perhaps a bit tight in diameter - and with a steel pocket clip configured for solely tip-up position. The clip is probably the only component that is not very pleasant from the aesthetic point of view - especially the excessive width of the area where the screws are housed. It is also rather cumbersome and so strong and unyielding that effort is needed to place the knife in the pocket; in addition when you tighten the grip on the handle, there is an arris on the flat part of the clip that houses the screws which causes discomfort to the little finger. The European retail price of the mini Onslaught is about 170,00 € for the satin blade version and about 190,00 € for the version with Cerakote black coating. The USA retail price is abut $ 145,00. 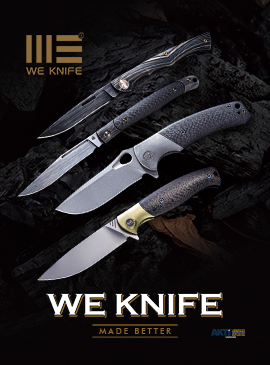 The cutting ability of the knife has been tested, on a qualitative level, on various materials (paper, cardboard, ropes of various diameters and different materials, car safety belt, and so on), demonstrating an extraordinary factory sharpening and great cutting edge retention. Opening and closing the knife with one hand is really very rapid and easy thanks to the AXIS Lock, and the overall ergonomics of the knife is comfortable. The Mini Onslaught, belonging to Benchmade "Blue Class" category, is certainly a great EDC knife offering very good cutting performance, the safety and convenience of the AXIS Lock mechanism and functional and aggressive design at the same time.